Located just west of Downtown Milwaukee, the Near West Side or also referred to as the "neighborhood of neighborhoods", is made up of seven separate unique neighborhoods, each with its own history. Home to a wide range of businesses and the five Anchor Institutions, this vibrant area has many jobs, thriving businesses, nonprofit organizations, high performing schools, healthcare institutions, restaurants and entertainment options. The Near West Side, as defined by the City of Milwaukee, is bound by I-43 (east), HWY 41 (west), Vliet Street and Highland Boulevard (north), I-94 (south). Nearly 28,000 people live in the NWS, including 10,000 university students. The Near West Side is known as the neighborhood of neighborhoods – rich with architectural character and historical housing. Some historical landmarks in the area include the Pabst Mansion, Ambassador Hotel and the Historic Eagles Club. Once known for being one of the wealthier areas in Milwaukee, the neighborhoods of the Near West Side are now known for affordable housing, plentiful businesses and a diverse demographic of residents. The area is seeing increasing investment, with more than $250 million invested over the past 5 years in institutions, housing and commercial development. A major anchor in the neighborhood, Marquette University, has been in the area since 1881. Other major institutions and anchors include Aurora Health Care, Harley-Davidson, MillerCoors and Potawatomi Business Development Corporation – all of which contribute to a strong work force in this neighborhood. Located just west of downtown Milwaukee, the Avenues West neighborhood is home to several institutions, light industrial and retail businesses, churches, schools and residential areas. Downtown attractions, sports and convention venues and major highways are just a short drive or walk away. The Avenues West Association is a not-for-profit neighborhood association that advocates for development and revitalization, aesthetic enhancement, cooperative marketing and planning, networking and safety throughout the Avenues West neighborhood. Along with its partner -- Business Improvement District (BID) #10 -- the association leads the way in promoting community stability, land balance and economic development. In the 1870s, Avenues West emerged as a neighborhood for Milwaukee’s wealthier set. Patrick Cudahy and Frederick Pabst were among the many well-known business owners in the city who owned mansions on Grand Avenue. It was a popular place for the elite to be. Residents worshiped at Protestant churches, including St. James Episcopal and Calvary Presbyterian. For those Irish Catholics who made Tory Hill home, an industrial working class neighborhood that bordered Avenues West, St. Gall’s and Holy Name were primary worship sites. Both of these churches were run by Jesuits of the Society of Jesus who started up Marquette College (now University) in 1881 on 10th and State Streets. If Grand Avenue mansions did not disappear during the Great Depression, many were remodeled into multi-family units or replaced by apartment buildings. Several hospitals, the Ambassador Hotel, and the Milwaukee Courthouse would come to support the changing residential landscape of Avenues West. The neighborhood of Avenues West is now known for its affordable housing and rich demographic diversity. It is both residential and commercial in an urban setting and makes Avenues West a distinct and unique neighborhood in Milwaukee. The Cold Spring Park Historic Neighborhood is located in the City of Milwaukee, Wisconsin. It includes the predominantly residential community between 27th Street on the East and 35th Street on the West, from Highland Blvd. on the South to Vliet Street on the north. It encompasses the McKinley Blvd. area designated by the City of Milwaukee as the Cold Spring Park Historic District. To the south, Juneau Avenue is a mix of similarly beautifully constructed single and multi family homes in a mix of styles and designs. The connecting side streets are smaller homes of distinctive quality, with natural wood work, built in cabinets, and large yards. Today, Cold Spring Park is proudly home to residents of mixed ages, ethnicity, religion, family size and orientation, and social-economic backgrounds. Daily, residents meet each other walking their children, exercising their dogs, strolling the neighborhood, or simply greeting neighbors from their front porch. We watch out for and take care of each other as one big “block watch.” We protect our safety and security in cooperation with the District 3 MPD. We are improving a City-owned empty lot at 28th and McKinley as the Cold Spring Park Garden. We sponsor neighborhood clean ups, Summer social activities, a neighborhood rummage sale, and Winter decorations and a Holiday dinner. During the Civil War, Cold Spring Park was the site of Camp Washburn. The 2nd Calvary, 30th Infantry, and 29th Regiment were housed in the park and was one of three locations in Milwaukee chosen for military camps. Before the neighborhood of Cold Spring Park was officially developed, the land between 27th and 35th Streets and Juneau and Vliet was one of the largest private parks on the West Side of Milwaukee. It was named Cold Spring Park and took up 16 city blocks - the perfect size for the sport of horse racing. Since 1884, trotters would run in the park and driving clubs would host meets. The amenities of the Cold Spring House was a hotel that visitors and drivers enjoyed before and during the races. The park was also large enough to host the Wisconsin State Agricultural Society’s second fair and exhibition. Early city planning for a boulevard system called for neighborhoods that would connect major parks in Milwaukee. These roads were beautifully landscaped and included residential architecture. McKinley Boulevard was the second boulevard to be established in Milwaukee and at one point in time was one of the most distinguished addresses in the city. McKinley Boulevard made a wide path through the middle of Cold Spring Park and restricted busy traffic. Once the land of Cold Spring Park was sold and divided into house lots, the area became mostly residential. Its homes are known for their high level of craftsmanship, with varying styles of Arts and Crafts, Colonial Revival, and Neoclassical. The neighborhood has a rich and variegated architectural character that pays homage to the upper-middle class in the 1900s who languished on grand porch fronts and backyards. Most of the homes were built as single family or duplex homes, but many were later turned into multi-family homes. Like Avenues West, the Concordia neighborhood was home for Milwaukee’s wealthy to root. Dr. Robert Faries, one of the first dentists by trade in Wisconsin, built his home near 30th and State. It enjoys landmark status as one of the oldest building in Concordia. The Pabsts, Usingers, and Pritzlaffs were among those who had Highland Boulevard mansions. The Victorian style homes stand today with the help of the Historic Preservation movement in the 1970s and passionate residents who formed the Historic Concordia Neighborhood Inc. in the 1980s. The neighborhood took its name from Concordia College (1881). The college moved to 31st and State in 1883 and a neighborhood filled in around the new campus from 1895-1915. Concordia College purchased single family homes to both expand campus and appeal to their growing student body. In 1983 the campus moved to Mequon and added to the marked changes in landscape already occurring in Concordia. Like Avenues West, large homes came to be modified into multi-family homes and apartments. Partnering with the Potawatomi (anchored in the Menomonee Valley with a casino), the Indian Community School moved into the old Concordia campus in 1990 (only relocating to the suburbs in 2007). In 2010, the Forest County Potawatomi had a vision to restore the historic campus buildings and authored a vital redevelopment plan that would house tribal offices and businesses. The Potawatomi add distinctive diversity to Concordia, but the neighborhood boasts representation from almost every Milwaukee ethnic group. 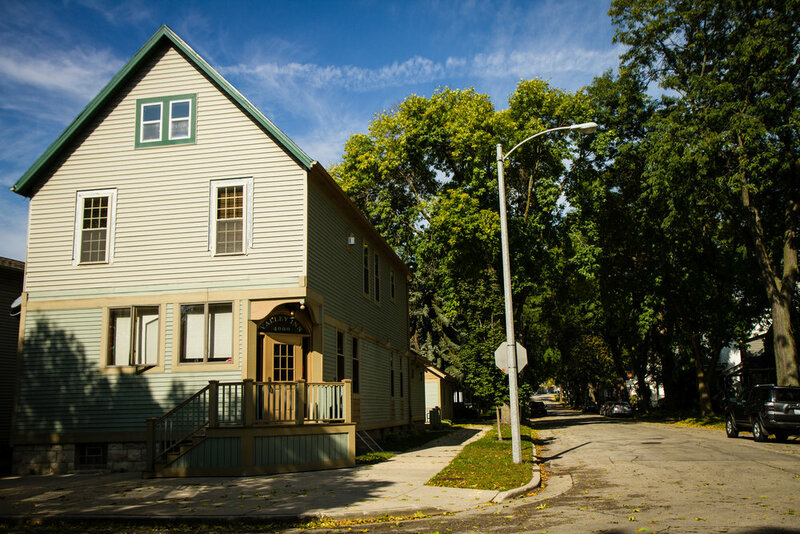 The Martin Drive Neighborhood is a small, safe and affordable neighborhood on the west side of Milwaukee, fortuitously located between beautiful Washington Park to the north and historic Miller Valley to the south. Due to its tucked away location, the Martin Drive Neighborhood is quiet and surprisingly free of traffic. Its mainly one-way, tree lined streets are often host to joggers, dog walkers and groups of children at play. One of the most attractive aspects of the Martin Drive Neighborhood is its diverse and active residents, many of whom are involved in the close-knit neighborhood association. The Martin Drive Neighborhood Association is continually working to increase communication between neighbors, encouraging residents to aid in community projects and always striving to become the best neighborhood we can be! Community gardens, farmers markets, outdoor movies, and annual Trick or Treats bring families together. The Martin Drive neighborhood was co-founded by Morgan Martin and Solomon Juneau in 1835. The neighborhood's namesake Morgan Martin was a Green Bay lawyer, Wisconsin Congressman, Assemblyman, and State Senator. The physical western borders of Martin Drive were altered in the 1950s with the construction of Highway 41 and its ramps. Many homes had to be moved with the erasure of 47th street. Starting in the 1990s, Martin Drive neighbors began to work cohesively to revitalize their community. To attract new owners, residents began to renovate existing housing stock (that range from Victorian to brick, single family to duplex and multi-family), build decorative fencing, pave driveways, organize community clean-ups and enhance landscaping. In 2012, Little Free Libraries were placed around the neighborhood and serve as welcoming sentinels that a community is alive and well. Merrill Park was founded by Milwaukee Road manager Sherburn S. Merrill. Merrill was also a farmer. By 1878, he purchased enough land to stake claim in everything between 30th and 35th Streets. Most of this land was sold to residents who ended up working for Milwaukee Road. The neighborhood’s first residents were mostly Irish families, but eventually became home to many African Americans, Latinos, Italians, Croatians and Slovenians. Merrill Park could have cleaved along ethnic lines if it were not for institutions like St. Rose Parish. The Church was built in 1888 on 30th and Michigan Streets and regularly brought the community together through religious, social, athletic, political, and educational events. The church stands as the main landmark in the neighborhood today. Even though many homes and mansions were razed or converted into offices and apartments, Merrill Park retains special aesthetic features. Institutions like Marquette University High School and the Tripoli Shrine Masonic Temple built in the 1920s for example, still stand as strong edifices against an urban backdrop. The neighborhood reeled from the shuttering of Milwaukee Road in 1977 and I-94 construction that changed its boundaries, yet managed to retain its self-help tradition and philosophy. St. Rose Parish’s Community Beautification and Stabilization Committee, as well as the Merrill Park Neighborhood Association are testaments to Merrill Park’s inherent strengths. Frederick J. Miller was born in Germany in 1824, and moved to the United States in 1854. During his time in Germany, he was a brewer at the Royal Brewery in Sigmaringen. Upon his arrival in New York City, Miller and his family traveled by ship to New Orleans and then up the Mississippi River to Prairie du Chien, Wisconsin. He eventually settled on the west side of Milwaukee and purchased Plank Road Brewery - the current site of MillerCoors’ Milwaukee brewery. Milwaukee was the ideal place for Miller to start his brewery. Its true, cold winters were needed for fermentation and storage before refrigeration and the lake provided pure water and ice. Caves in the area were storage for troves of ice and kegged beer. Milwaukee also had a huge German heritage with an abundant supply of beer drinkers. The beer garden established a few miles away became a major attraction. Miller’s last residence still sits on Miller Lane above the Miller Valley. The neighborhood of Piggsville had humble beginnings as rural farm land and received its name from the profession of local pig farmer named Freis. Until 1925, Piggsville was a rural Milwaukee outpost with gravel roads, outhouses and wells. At first, the neighborhood was home to German immigrants. Slovakians, Serbians, Croatians, Czechs, Poles, and Russians settled in later on. By 1910, the neighborhood with highly residential with Milwaukee Road shops, Miller Brewery and other plants nearby to provide a solid economic base. Piggsville is little known to outsiders because of its near invisibility. Many bridges run above the neighborhood, leaving the homes in seclusion below. Historically, the neighborhood was self-supporting. It teemed with grocery stores, butcher shops, bakeries, and taverns. Residents did not have to leave its boundaries too often, which engendered a very close-knit community. But physical infrastructure developments deeply altered the character of Piggsville: I-94 was built to border the south side of the neighborhood, the Wisconsin Avenue Bridge was replaced, the 1997 floodwall was erected on the Menomonee River, and Miller expanded. Many homes and taverns were lost. Demographic changes occurred too with more working class African Americans, Whites, and Latinos moving into the neighborhood. Amidst the changing state of Piggsville, the neighborhood strives to hold the close-knit traditions from the past. It is known today for its affordable housing, strong sense of identity, and peaceful location.